Skirmishing among colleagues is a fun way to unwind. It promotes camaraderie among comrades and it will test your strategic skills, agility, flexibility, and timing. One of the greatest players in this wholesome warfare is the sniper. And a sniper – despite his great skill would amount to nothing without the proper equipment. The Crosman Stinger R34 Tactical is perhaps one of the greatest airsoft rifles you can lay your hands on. It enables its handler to take short-range and long-range shots – perfect for retaining the sniper’s stealth and strategic position. While it may not be the common shooter’s rave in terms of firing mechanism, the Stinger is a spring air repeater that packs a lot of oomph into ever BB it shoots. What to expect from the Crosman Stinger? 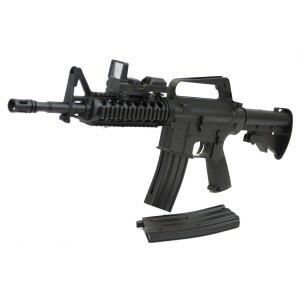 It is modeled after special Ops soldiers’ M4, keeping it a spitting image to the real thing. It weighs a comfortable 2.04 kg (4.5 lbs.) that makes it easy to carry around, ready for combat at any given time. This makes the Stinger 34 a flexible rifle that could be switched between a sniper rifle and an assault rifle. With the awesome hop up system, it enables the handler to have increased accuracy, distance and agility. 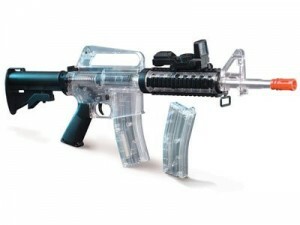 It has a four-sided rail that enables you to efficiently mount a number of useful accessories such as a tactical scope and flashlight among others. It is a spring action repeater that packs as much as 310 to 375 FPS; giving it an added advantage for both short-range and long-range shots. 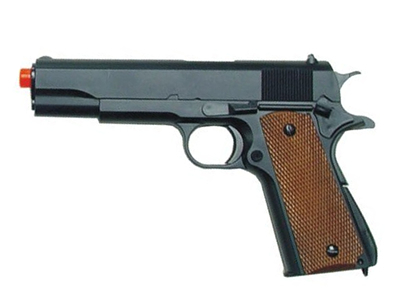 Holds 18 BBs in the clip and another 400 in the reservoir with a quick-reload function. The LED flashlight is awsome, but the scope is even better. Most reviews say the scope is terrible, but all you have to do is move it around the rail until its in perfect position, about five minutes is all that takes. The barrel is made from precision aluminum with a length of 11.1 cm or 4.37 inches and the overall length is about 23.75 inches or 60.33 cm to 33.5 inches or 85.09 cm – perfect for any built that even a 13-year old can handle without a hitch. 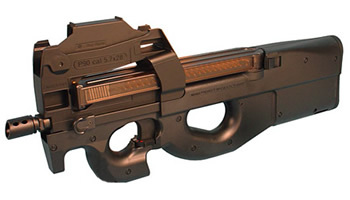 The stock can be easily removed to enhance stability. Comes in two colors – black and clear that provides you with the flexibility and advantage to use it with utmost stealth, depending on the setting. 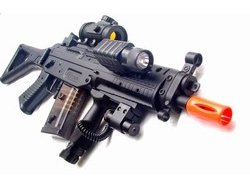 This gun is really nice for beginning airsoft it is very accurate and shoot far. Also it hurt but not too hard. The red cross is ok but u wont gonna always use it. when i got the gun, i thought the flashlight was not useful, i was wrong. When you are the night the flashlight don’t just illuminate ur target it also make ur aim realy easiest too see. At all, it is a really good gun for the price and worth it. Is the Crosman Stinger R34 Tactical a Good Buy? With the aforementioned features, there really isn’t much left to say to convince one to get a Crosman Stinger R34 Airsoft Rifle . Individuals who want a reliable airsoft rifle in their hands would love the Stinger 34 Tactical. The features that it has to offer are more than enough to allow shooters to have the flexibility to move between sniping and head on combat. While some say that the limited 18-BB clip capacity tends to get annoying at times, it is more than enough to keep you afloat during tactical plays. And because it is easy to handle, a 13-year old will have no problems with it. With the clear version of the rifle, you will have the advantage of seeing how many BBs you have left in your clip. However, if you are playing at night with a clear rifle, make sure that you are not armed with glow in the dark BBs unless you want to give your position away. The black version is an awesome choice if you’re playing in a darker setting – just make sure that you keep a good position so the tip of the barrel won’t give you away. Finally, with all the raves and great features that the Crosman Stinger R34 rifle has to offer, it is affordable. At a mere $30 , you will have more than enough left in your pocket to spend on other useful accessories. Moreover, because you’ll get 2 clips when you purchase the rifle, you won’t need to worry about spending on another clip, giving you the advantage to buy a really awesome sight or flashlight for night skirmishes.